Seeing as how I spend 99 percent of my time in my office, or at least it feels that way, I am in the mood for change. A change of color. A change of artwork on the wall. Just basically a change of scenery. So without spending a whole lot of time analyzing things, because of course I'll have to adapt things, which of these is your favorite? I could live in either one. #2 please...just because it has more storage, and I'm a sucker for white cabinets :) I can't wait to read about a room remodel, there's no turning back now! I agree with Katie. I like #2. It just looks more you! #2 looks more like you to me too...although I really like the color in #1 and the bright white modular cabinets of #2...Wait, there's not a speck of orange in either of these?!? I like #2, but I'd use the wall color from #1. 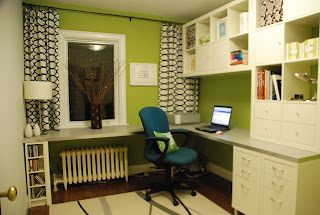 Well, I'm partial to the blue walls of #1, but I like the wall storage and workspace in #2. My personal preference is #1(that wall color just invites me in)...but for you I think I'd choose #2 something about the green walls, the modular storage and the bold curtains say "Cindy!" I'd go with #2 for the overall effect, but I like the wall color in #1 and I love those huge scissors on the wall. I vote for #2. Love the green! I've got to go with the crowd on this one. I like #2, but you could definetly combine the color from #1 with the storage from #2.Please keep us posted, room redos are my favorite thing! I am not a green person - but I vote for door number two. It is you. I really like the blue in #1, so to say that you should choose two is a big deal. Val chooses number two, too! Love the green and the white. it looks so fresh and organized. 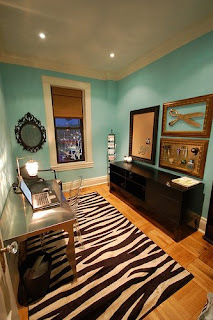 That would be such a great workspace.